Plant lovers can’t stop themselves; they have to bring the beauty into their home. Indoor plants allow you to bring the natural beauty of all plants into your house, especially if you don’t have time to weed outside frequently. There are a large number of plants in the cactus family, as well as many that do well indoors. Take a look at the different indoor cactus types! The great thing about almost all of these plants is that they are easy to grow. You don’t have to worry about watering too frequently. Most of the time, you need to allow the soil to dry out completely before watering again. If you are a forgetful person, you couldn’t pick a better type of plant to grow indoors. Often referred to as a T. santiaguensis, these are the classic cactus type that you imagine – a columnar shape. 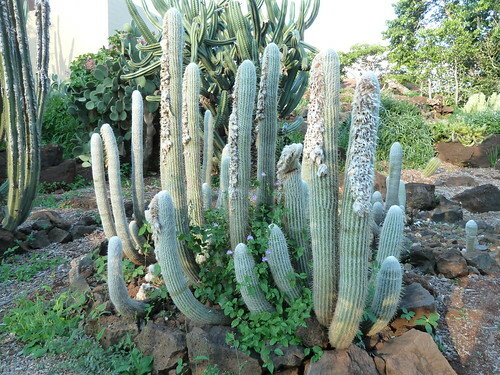 Over time, additional branches may form at the base of the cactus. 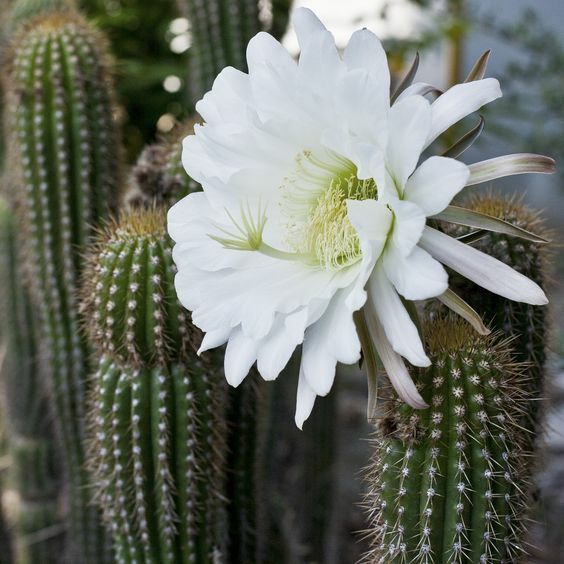 They start off as a brighter green, but a mature Trichocereus turns to a yellow color. You will notice ribs across the entire cactus, ranging between ten and fifteen. Every plant has a different number, and the sizes of the ribs vary from plant to plant. If you are looking for a more classic looking indoor cactus, the Trichocereus Spachianus could be a fantastic choice! If you are looking for an attractive indoor cactus, a Christmas Cactus is a flowering plant. The bright flowers are vibrant and show off well as a centerpiece in your house. For the best results, you should keep the soil dry two inches below the surface. It doesn’t need to be frequently watered, even though it flowers. You have a higher chance of over watering than dehydrating your lovely Christmas cactus. The only other thing you should do for your plant is to add a medium fertilizer throughout the summer. There are over 200 different species of Pincushion Cacti available. Here are some popular choices! Snowball Cushion Cactus are ball shaped with white felt on the exterior of the plant. Giant Snake cactus plants have very long stems. Old Lady cacti have fuzzy hair with purplish red flowers. They are all ball-shaped plants that are one of the most common types of cacti grown in indoors. Novice gardeners typically have great success with these types because they are drought tolerant and prefer an arid desert. It is best for the cactus plants to be planted in well-drained soil that should dry out entirely before watering. Star Cacti, Astrophytum, have separated ribs that give the cactus the look of a star when viewed at from above. The rounded form, when it is young, has fuzzy scales and yellow flowers. Another choice is the sea urchin cactus, Astrophytum Asterias. These cacti don’t have any spine and are shaped like a saucer, with red and yellow flowers. However, these flowers won’t appear until the cactus matures for five years. This plant isn’t for one who expects beauty immediately. Gardeners also like Bishop’s cap, Astrophytum myriostigma, which has a rounded shape with fuzzy scales. Just like the sea urchin cactus, Bishop’s cap is spineless and grows yellow flowers. Indoor cactus types come in a variety of shapes. Globular cactus comes in a variety of shapes and sizes. Coryphantha Vivipara grows in a small, globular shape, or it may appear in globular segments. No matter the shape, all of this cactus are covered in shape spines. There are a few other choices for gardeners if you like a globular shaped cactus. 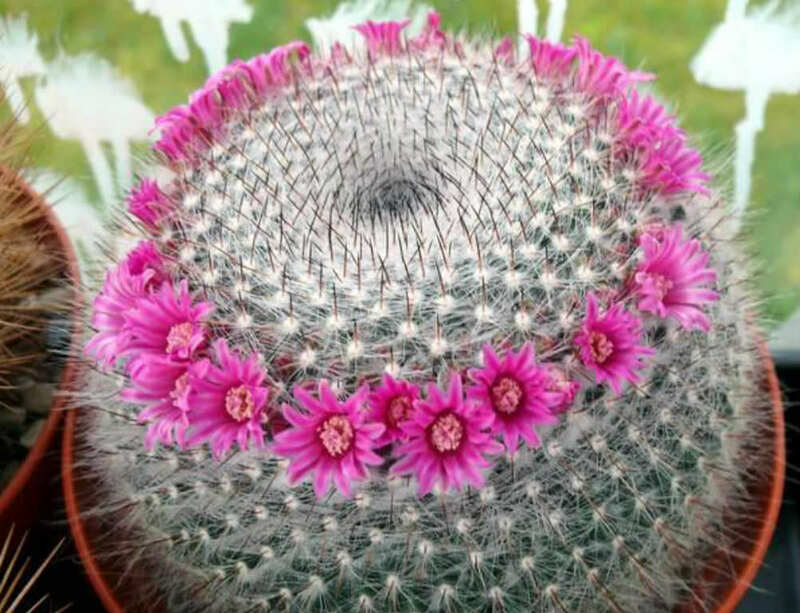 Chin Cacti, Gymnocalycium, and Hedgehog Cacti, Echinocereus, are covered in small, compact flowers, ranging from light pink to red and magenta. If you prefer yellow spines and flowers, Notocactus, also referred to as Golden Ball Cacti, is a lovely color and shape. Bunny Cacti grow natively in northern Mexico and many deserts in the southwestern United States. It grows in a shrub-like appearance, and it can grow around two to five feet tall once matured. Some people refer to these cactus plants as the Polka Dot Cactus, but the Bunny Cacti is a better description of its appearance. In late spring, the Bunny Cacti begins to bud. In early summer, two inches wide, creamy yellow blossoms will cover the wide plant. Later, these yellow blossoms turn into two inch long fruits, varying in color from purple to red. 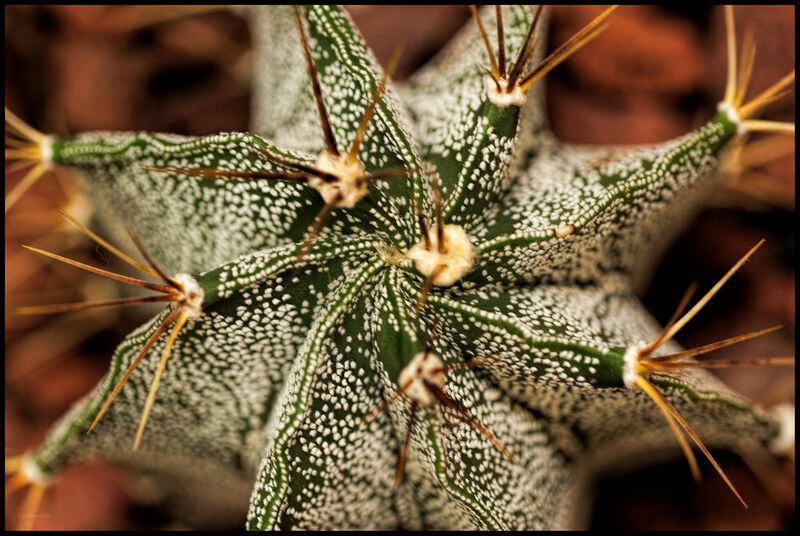 Just like other indoor cactus plants, you should avoid overwatering these cactus plants and keep them in full sun, except for the winter. Many gardeners want to grow Cephalocereus cactus, but the Cephalocereus Palmeri is the most common choice. They are a faster-growing variety that has fewer ribs, ranging from seven to nine. When they are a young plant, Palmeri cacti typically have a bluish tinge. If you find one of these lovely cactus plants growing in Eastern Mexico, you’ll notice that they can reach up to 20 feet tall! Branches jut out from the main stem, typically a dozen or more! One of the most noticeable features of the Cephalocereus Palmeri is the thousands of long white hairs going up and down the ribs. Underneath of these white hairs, you will find ten radial spines. However, over time, a mature Palmeri will lose many of its lower hairs at the base. These are just the tip of the choices for indoor cactus types. Each shape tends to have dozens, or hundreds, of species. If you love the globular shape, you could find a dozen different colors and sizes. Cactus plants are a novice gardeners best friend! H﻿ow Often Do You Water A Cactus?